There are lots of things in the autograph business that make no sense to me. But near the top of my list is why autographs of Boston Celtics Hall of Famers are so hard to sell. The Celtics are the New York Yankees of the NBA, having won 17 championships including a ridiculous run of 11 in 13 years from 1957 through 1969. The team is still among the most popular 3 or 4 teams in the league today. The franchise hasn't moved, and has been very careful to maintain links to the past by wearing the same uniforms. Even when the Celtics moved to a new arena, they made sure the floor looked like the old Boston Garden parquet and eventually changed the name to "TD Garden." The Celtics basically have their own wing in the Basketball Hall of Fame. Most of the key figures from the Celtics dynasty years through the glory years of the 1980s are enshrined: Red Auerbach, Larry Bird, Bob Cousy, Dave Cowens, John Havlicek, Dennis Johnson, K.C. Jones, Sam Jones, Kevin McHale, Robert Parish, Frank Ramsey, Bill Russell, Bill Sharman. Most of the aforementioned players were included among the NBA's 50 Greatest Players in 1997. Hell, Bird, Cousy and Russell rank among anyone's top dozen greatest and most important players in NBA history. Yet with the exception of Bird -- and DJ when he died too young in 2007 -- I've seen minimal demand for autographs of any of these legends since I started my business in 1999. It's not like they are easy to get. Auerbach died in 2006. Havlicek, Sam Jones and Parish are extremely reluctant to sign for free. �Cousy and Cowens will sign for free sometimes but typically personalize any item of value. 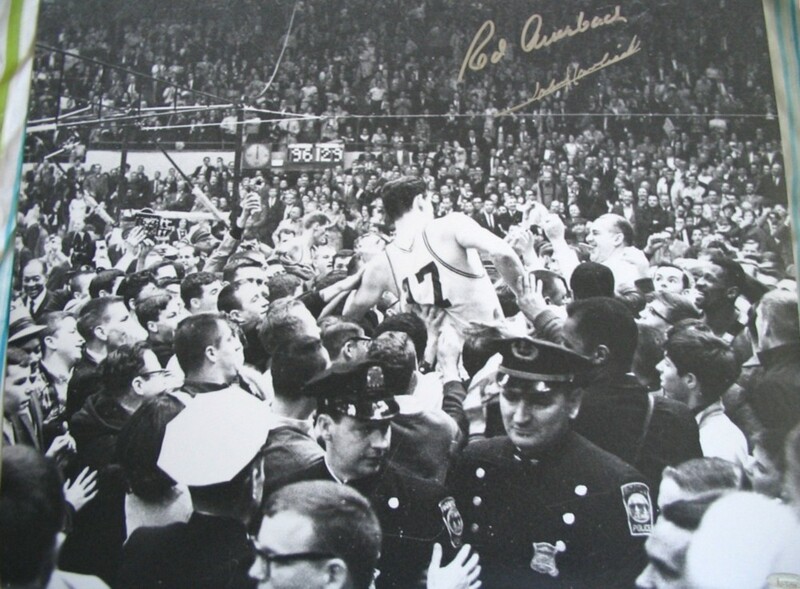 Bill Russell is impossible to get for free, and he charges an arm and a leg at signings. It's true that most NBA fans today never saw Bird play, much less Havlicek or Cousy. But that hasn't stopped people from buying autographs of Yogi Berra or Willie Mays or Jim Brown or Gale Sayers or Johnny Unitas or Gordie Howe or Bobby Orr or Bernie Parent. Yet somehow, these old Celtics legends who sign a lot less and won a lot more championships for their sport's premier franchise, are difficult to sell. Was the NBA a less prominent sport than the NFL? Maybe during the 1950s, 1960s and 1970s, but not during the 1980s (thanks partly to Bird). And the NBA certainly was equal or greater to the NHL during that entire era. So to be perfectly honest, I have no explanation. If you do, please let me know.